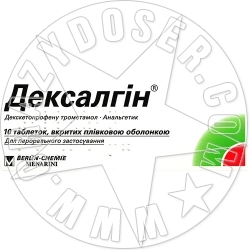 is an NSAID that demonstrates anti-inflammatory, analgesic and antipyretic activity. depending on the intensity of pain, a single dose is 12.5-25 mg every 8 hours. It is not recommended to take> 75 mg (3 tablets) per day. Dexalgin is taken as needed, not intended for long-term treatment !